This may not look very impressive, but please let me assure you that it tastes like heaven on a plate. I've had a strong aversion to pesto since my pregnancy. It's the only weird quirk remaining from those months when I couldn't eat anything, which are now a blur. Luckily that aversion is specific to basil pesto, because broccoli pesto might be the best thing I've ever eaten. I tossed this with pasta for dinner one night and ate the leftovers for days. Blogging about this now and remembering how tasty this was has me salivating; this will be on the menu again very soon. 1. Bring a large pot of salted water to boil for your pasta. 2. Remove broccoli florets from stems and chop into medium florets. Peel stems with a vegetable peeler and slice them into 1/2-inch segments. 3. Use your pot of future pasta water to steam (by suspending a mesh strainer over your pasta pot and covering it with a lid for 5 to 6 minutes)) or par-boil (for 3 to 5 minutes) your broccoli florets and stems until just tender, then drain if needed and set them aside. 4. Add pasta to water and cook until al dente, or about one minute less than fully cooked. Before draining pasta, reserve a cup of pasta cooking water and set it aside. Drain pasta. 5. Wipe out pot so that you can use it again. In the bottom of pot, melt butter and olive oil together over medium heat. Add onion and reduce to medium-low, sauteing it until tender, about 7 minutes. Add garlic and cook for another two minutes. Add steamed broccoli, salt and red or black pepper and turn the heat back up to medium-high, cooking it with the onion and garlic for a few additional minutes. Pour cream over mixture and let cook for 30 seconds. 6. 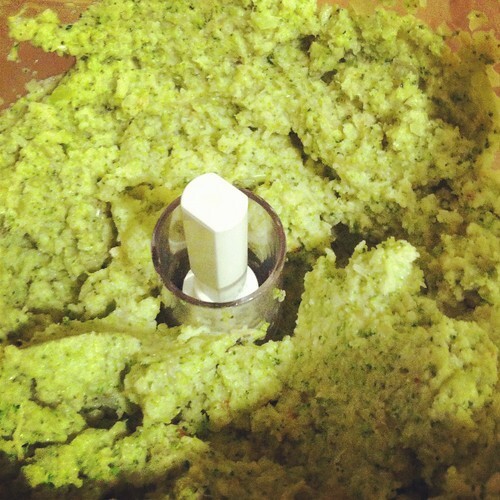 Transfer broccoli mixture and all of its creamy bits at the bottom of the pan to a blender or food processor and blend in short bursts until it’s finely chopped and a little sauce. Don’t worry if it looks dry; that reserved pasta water will give it the sauciness it needs in a minute. 7. Add the broccoli sauce back to the pot with the drained spaghetti and a splash or two of the reserved pasta water. Cook over medium-high for 1 to 2 minutes, tossing the mixture so that it evenly coats. Add more pasta water as needed to loosen the sauce. Adjust seasonings to taste, adding more salt or pepper, and scoop into a serving bowl. Shower spaghetti with grated parmesan and dig in.